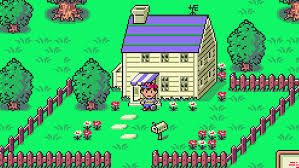 Earthbound, while a huge hit in Japan and actually the second game in a series known as Mother, it didn't quite hit the same impact here in North America and especially in Europe where it was never released. 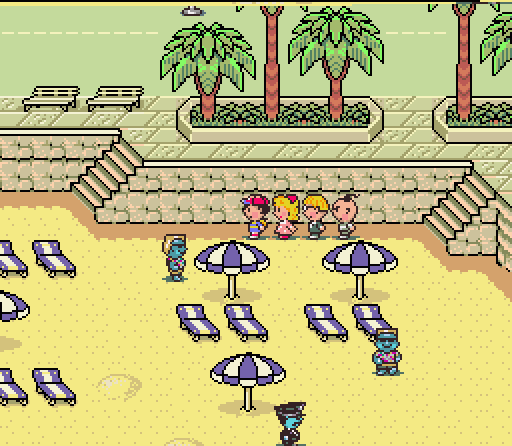 Because of that Earthbound has somewhat developed a cult following here in the States. 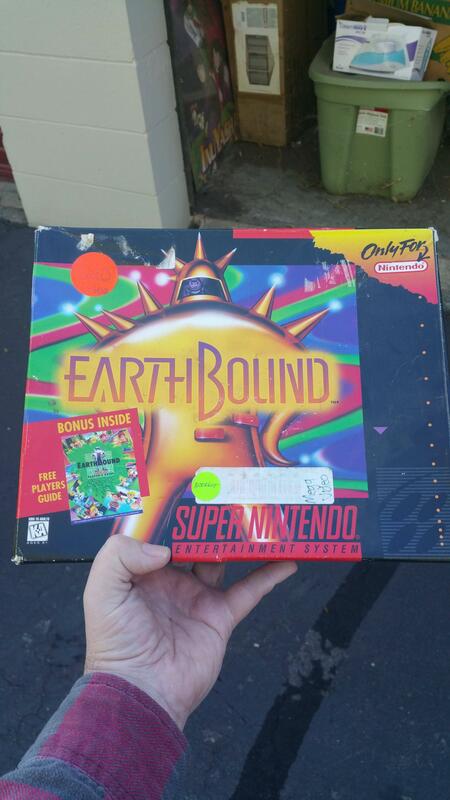 Sure a lot of people have heard about Earthbound, some know of the hero Ness from the Smash Bros series and a lot of people know it due to the high prices this game can fetch on auction sites like Ebay, going anywhere from $80 to $200. Release originally for the SNES in 1995 in North America it grabbed most people's attention because the game was packaged with a strategy guide, which back in those early internet days was most gamers only way of getting help in games, unless they wanted to call a 1-900 number for a fee or hope that someone on the playground knew the answer to their questions. Even though it came with the guide Earthbound's real strength and charm is the uniqueness this game offers. Instantly when starting the game players will notice that the main hero isn't an armor clad warrior or fireball casting mage but a teenage boy in a ball cap. Instead of wielding a sword or an axe you get baseball bats and yo-yos as weapons. Yet other than its modern day aspects the game still plays like a typical 16 bit era RPG. The basic premise of the game is that you play the hero Ness just your typical run of the mill teenage boy who has to stop an alien invasion. While traveling the world over on your main mission just like any typical RPG, you do come across towns with its own little problems which you have to solve as well. Along the way you meet three other characters a girl, a boy genius and a prince from a distant land and they join you on your quest. Just like any RPG of that time you earn money and experience for defeating enemies which range from stray dogs, to cranky old ladies, to evil alien beings, and even a pile of puke to make you stronger. With the money, which is deposited into your ATM account by your father, you can visit stores and purchase better weapon, armor and items for healing. Speaking of healing items to go along with the modern setting you wont be stocking up on potions instead you will be stocking up on food items like pizza and hamburgers. At one point of the game you can even use a phone and place an order for a pipping hot pizza to be delivered right to you. Besides the modern day setting one other quirk with this game that I would like to point out is the hit point meter. Instead of the traditional hp meter that a RPG has Earthbound hit point meter works in the fashion of an odometer. That is instead of instantly dropping you down to your new hit point total after a hit it rolls down digit by digit to get to your new total. What that means is that even if you take a critical hit, you can still keep the reaper away if you heal yourself quick enough before the meter rolls down to zero. As far as play style goes, this plays like your typical 16 bit RPG. When you get into a battle you have your traditional RPG choices of fight, magic, which is called PSI in this game, item, and run way in a turn combat fashion. At some points you will have to grind some levels to take on a nasty area and some parts the clues will be cryptic like RPGs were back in that era. There are some slow parts where the action is slim and there will be times where exploration and talking to everyone can save you an hours worth of not knowing where to go or what to do, but than again there is the guide if you do get stuck. Yes you read that right just like how the original cartridge came with a guide the VC version will have a digital copy of the same guide include with your purchase. So even if you do get stuck you can quickly reference the guide on the Wii U gamepad. As far as music goes this game as one of the rockinest soundtracks in the 16 bit era. In fact the soundtrack itself was rumored one of the reason why Nintendo took so long to release this game on VC. Some of the tracks do sound like rips off some popular songs mainly the one boss theme has been liken to the song Johnny B Goode by Chuck Berry. Now whether this was the reason or not I am happy to say that so far none of the music has been changed at least that I have noticed. Graphically the game is beautiful and has a cartoony look to it typical of most 16 bit games. Yet with the story of alien invaders and crazed hippies the graphics do seem appropriate for this game. Colors are nice and vivid as well when needed yet bleak and dreary when the game calls for it for example in a ton infested with zombies. As with most Wii U VC games Earthbound offers off TV play which is nice since this game does offer a good amount of length even with the fact that at a few spots you have to grind. Along with the off TV play this game also includes the option of save stats just in case you are in the middle of that cave and need to stop playing, and as well customized controls. 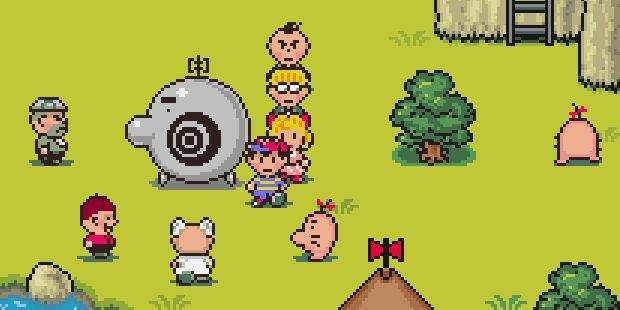 Earthbound may play like your typical RPG but the modern setting makes it a unique adventure that any RPG fan will love. It may take some time to get use to and it could be difficult for those who are use to more modern RPGs but you have the digital guide to help you out. Its easy to see why this game become a cult hit with its unique setting, crazy enemies and rockin music. Its is definitely an RPG that no RPG fan would want to miss. After playing this game you will see why its cherished by so many. It is now available on the Wii U eShop in both North America and Europe. 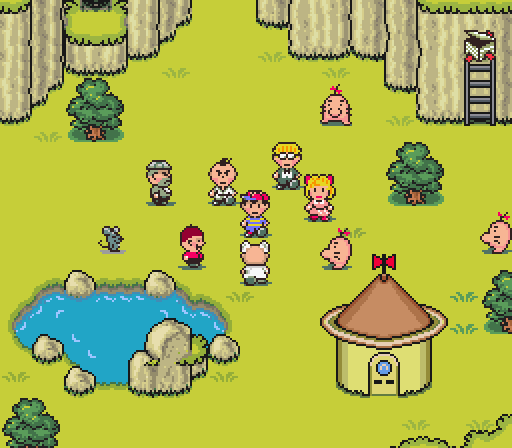 I love Earthbound so I'll have to download this very soon. As you can see from my new avatar I absolutely love this game! I hope Mother 3 will be released at some point too! @Kushina your new avatar is kawaii! @Tasuki this is a great review! Great work on your review Tasuki ! I personally wanted to review this game actually, but I really didn't know how different this version was compared to the original. This game rocks and so does your review Tasuki! @Kushina: Sadly I dont think Mother 3 will see a NA VC release since its ever been translated or anything for NA. Still you never no they might. Personally I would love to see one and three. @Jnes: Oh geez I am sorry. Next time I plan a review I will speak to you before hand so we don't have this happen again. My brother has made it to Fourside and so far there doesn't seem to be any changes at all. Music, characters appearances its all the same so far. I actually have the original cart (bought it brand new back in 95) and I did a play through about six months ago so its still fresh in my mind. It was released on the Gameboy Advance in North America and since the Wii U Virtual Console supports games from the Gameboy Advance I thought it might be possible. Don't worry ! there's no hurt feelings or anything, just enjoy the game ! @Kushina: I think you might be mistaken. Mother 3 was never released in NA on any platform. The closest they ever had was a fan translation group releasing a patch that would translate the game into English, that that wasn't an official game and I can't say any more about that here. That's so strange because I know that I have seen Mother 3 on the Gameboy Advance at Gamestop before. Could someone get in trouble for buying a pirated game from a place such as Gamestop? It makes me really question purchasing games from them because I do not want to support piracy. Well I dont want to derail the thread but I have heard of people getting pirated games from Gamestop when buying used games because the employees dont catch that they are pirated games. Also I do believe that the GBA is not region locked so it could be possible that someone imported the game and than traded it into Gamestop. Nice review @Tasuki! ^_^ By the way what is this contest piece at the end of the review? Wow it's amazing that it's been 3 years since I wrote this, lol. @Anime_Gurl: Thanks though I am not sure what your are asking about at the end of the review. @Tasuki I fixed that. I forgot to remove a hidden contest piece that a placed there for a giveaway. Anyways welcome back! Are you going to write more retro-tastic reviews for our website?